Korinthian Violins offers rehairs for all sizes of violin, viola, cello and bass bows. The cost is $65 for violin and viola, $75 for cello, and $90 for bass bows. A rehair includes a thorough cleaning of all parts and polishing of the stick. The turnaround time is usually one day, but appointments are necessary to insure specific pickup times. Same day rehairs are possible, but incur an additional $10 fee. We use the same superior quality Mongolian horse hair for all bows. Korinthian Violins can also replace leather thumbgrips for $30, lizard thubgrips for $45, and collars for $10. We do not do advanced bow repair or restoration, such as wraps, eyelet work, replacement of slides or eyes, or headplate repair. 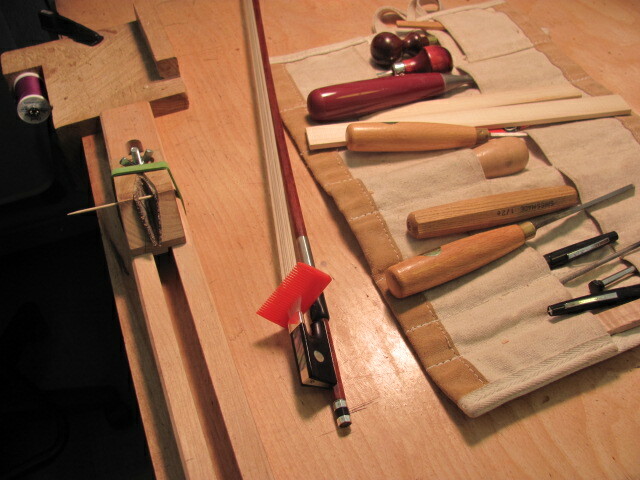 For more advanced bow work or bow appraisals we recommend John Hawkins at 920-912-0412.